Ahead of today’s meeting of eurozone finance ministers we thought we’d (finally) get round to posting some of our thoughts on the last week’s leaked Troika report on Greece. The report, as may be expected, left much to be desired – and we’re not just talking about the copious glaring gaps where the eurozone and the IMF could not agree (the missing new debt sustainability analysis being the more prominent). The firefighters are fighting amongst themselves as one paper put it. The report suggests that the cost of providing Greece with a two year bailout extension will be €32.6bn – very much in line with our estimates of between €28.5bn and €39bn. Interestingly, up to €20.3bn of this total is due broader problems with the original bailout programme, with the troika suggesting only €12.4bn will specifically be for the fiscal adjustment. This may not seem like it matters much but it highlights that the financing issues don’t just come from fiscal issues but also low growth, increasing arrears, banking sector problems and more. - The unemployment figures, as in the recent Greek budget, seem to be hopeless optimistic – potentially more so than before, since the Troika see unemployment in 2014-2016 being 0.4% below where the Greek government does. Elstat (Greek Statistics Agency) put unemployment at 25.4% at the end of August, while the Troika expects it to be 22.4% by the end of the year. A 3% drop in unemployment in a few months? That seems impossible anywhere but particularly in the current Greek economy. - The report expresses some deep concerns over the banking sector not least the “plummeting” deposits and the likely need to run down capital buffers due to significant levels of bad loans. However, it still concludes current levels of recapitalisation should be sufficient – we’re sceptical. - Despite, finally cutting defence spending, Greece still spends the third most (as % of GDP) in the EU. This continues to seem an obvious place to make savings, particular with NATO still going strong. - The collapse in real investment of 40% since 2009 is staggering if not surprising, yet the forecasts for investment both in the troika and budget reports only looks ever more optimistic because of it. - Government arrears continue to mount up, topping €8bn now. Despite presenting a significant challenge to wind down in the near future, these could also represent a drag on the domestic economy since most of the money is owned to domestic firms. That is to name but a few from an incomplete report – i.e. there are plenty more to come. As for the outcome of today’s meeting, we have low expectations as usual. The target is for a political agreement on the releasing the next two tranches of Greek funds (worth €44bn). This doesn’t sound much of a stretch but it will require confirming Greece has completed the necessary ‘prior actions’, as it claims, while the IMF is hesitant to release any more funds until it has settled on a plan which sticks to its view of Greek debt sustainability. The final part will be tricky with the IMF and the eurozone still seemingly someway apart on what they see as sustainable (despite the two of them also being someway apart from the rest of the economic and financial professions). A deal on how to fund the two year extension in the Greek bailout will likely need another meeting, while the release of funds still has to withstand the hazardous approval process of the German, Dutch and Finnish parliaments. Expect the debate over the issues above and more to dominate for another few weeks. We also will bump into the legal issue that Germany cannot write off as it would not be allowed to pay out new terms (as that is against its budgetlaw). Using ECB 'profits' (well because of dodgy bookkeeping that would put a normal person behind bars) will simply have to be a dividend by ECB to local CBs to governments. So run over all parliaments. Plus things like if interim dividend can be distributed in all 18 CBs involved and similar legal stuff. 2 More years means nothing it will be a term structure so likley the next problem is with the next term. may be they can brush that one under the table but the next one or the one after that will give the same show as we have now. Problem is and will remain all the plans are highly unrealistic (hugely overoptimistic)and Greece will not move till it is kicked forward and they will keep bumping into that. 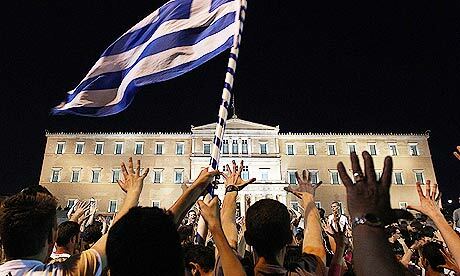 Come on, let's help the Greeks by letting them out of the Euro, and re-establishing their own economy. 57% of Greeks want to keep the Euro. 95% of rats like to eat rat poison. It does them no good. This is typical. The parties disagree but they can't even agree the figures they disagree about. Clearly crunch time has come and the Greek debts covered by loans from northern EU banks and the ECB are now worthless and must be considered now as gifts not loans. This mean that promises become MONEY. The sums are so huge that it would destabilise the whole eurozone and may well include the whole EU. The day of reckoning is here and most of the blinkered euro-fanatics can't comprehend at all what has happened. Rik above grasps the essentials though his scenario of more 'sweeping-under-the-carpet' seems highly problematic to me. The Germans have gambled and lost, They thought the day of reckoning could be indefinitely postponed but they are now up against a brick wall. Get the idea Merkel cannot do the simple maths. Greece has a liquidity and a solvency issue. Merkel want to give the 10 Bn extra. That however might solve part of the liquidity issue but makes the solvency issue even worse. While the IMF looks mainly solvency focussed. Bit disappointed I thought people were working towards a solution when we heard the 'waiting for the Troika report' stuff. But actually it looks like everybody was indeed waiting for it. Politicians telling the truth it should not get much weirder than that. Doubt if the IMF can move. Only thing I see if they accept the extra 10 Bn and that would be used for buying debt (with the market rebate). Will likely not work as planned (Bolivia if I am not mistaken). But that could provide them with some sort of acceptable excuse. Who cares if it works it is only coming up with an acceptable excuse. Btw Dutch are still against more debt. But they easily roll over at the end of the day usually. Anyway new date necesary for approval in Bundestag. Anyway this is a 3.0 likely requiring all sorts of approval procedures (2.0 took around half a year). The basic problem the whole set up is totally unrealistic so Greece will bump within 2 or 3 term again against the ceiling. Just before the next election in Germany possibly. Most likely we will see the choice: Greek default plus haircut and substantial budgettary effects or pulling the plug and budgettary effects. That will be a very interesting thing to see. Anyway Greek debt will be below 100% in 2020 or 2022. I can nearly guarantee that. The country will never be able to hold this one out for another decade. So there will be a haircut. Presumably two more years to get the creditors beyond their next critical elections?